1.1. Practice time. / 1.2. Practice contracts. 1.1.2. Praktice date (from to). It is possible to provide practice with interruptions. / 1.1.3. Total academic hours / 1.2.1 The practice was completed after signing a professional practice contract. Enter "Yes" or "No". / 1.2.2. The practice was accomplished by signing a voluntary practice agreement. If the practice was earlier, indicate the dates for signing voluntary agreements, and enter in brackets how much academic hours have been spent on practice. Add the contract to the practice plan. / 1.2.3. I would like volunteering to be counted as a professional. Enter "Yes" or "No". Fill in if you have volunteered in the past. 1.3. Practice guide at the University. / 1.4. Practice guide institutional/organizational leadership. 1.3.1. Name, surname. / 1.3.2. Phone number, email address. / 1.4.1. Name, surname. / 1.4.2. Phone number, email address. 1.5. Details of the student who completed the practice. 1.5.1. Name, surname. / 1.5.2.Studies program. / 1.5.3. Phone number. / 1.5.4. Email address. 2.1. Pagrindiniai duomenys apie instituciją/ organizaciją. / 2.2. Activities of the institution / organization. Briefly describe what activities the institution / organization is developing and what activities you have been assigned to carry out. 2.1.1. Company / organization name. / 2.1.2. Contact information. Address, phone, email, website. 2.3. What did you find out about institution / organization? Describe the structure of the institution / organization, management features, organizational innovation, organizational structure, etc. You can also briefly describe the history of the institution / organization. 2.3.1. Brief history. / 2.3.2. Vision, goals, mission and values. 2.4. Institution / organization communication. Discuss communication peculiarities. Identify disadvantages and advantages, evaluate them, and offer your solutions. 3.1. Practice purpose. Mention the purpose and briefly discuss how successful (how and why) to achieve it. The goals of the plan that are planned and implemented may vary. Describe the differences, write why they appeared. 3.2. Practice tasks. Mention the tasks of the practice and discuss each one in detail. Describe how the tasks have been implemented, what problems (not) have emerged, what methodological assistance has been given at the place of practice? 3.2.1. Task. Describe details by numbering in different rows. Tasks and the stages of their foreseen stages may vary with practice. If there are differences, then describe who and how they are determined. You can also mention specific dates for tasks. / 3.2.2. The course of the implementation of the task. What kind of problem / work did you have in advance (not) the intended problem and how did you deal with it? What are the decisions made? What methodological help was provided? How do you rate the task, and was it useful and why? Which study subjects have been useful in carrying out the task? / 3.2.3.Suggestions.How do you propose to solve a similar problem in the future? What kind of help would you need to have a similar problem? 3.3. Additional information. Filling is not necessary. Additional insights, comments, suggestions related to the aim and objectives of the practice can be provided. 4.1. Institution / organization assessment. How do you rate your institution / organization and why? Provide concise recommendations for improving the organization / company's performance. Describe how the institution / organization changed in practice and why? What innovations have been applied to? What more innovations would you like to deploy in an institution / organization? 4.2. Practice Guide. How do you rate the work of a tutor (guide a trainee) and why? What are your proposed changes in organizing your work, by identifying and performing tasks? 4.3. The benefits of professional practice and the decisive impact on future studies and work. What competences did you extend during your professional practice? How can the acquired knowledge be adapted to the real professional environment and the final thesis of the Bachelor? 5.5. Comments on the practice report and assessment. 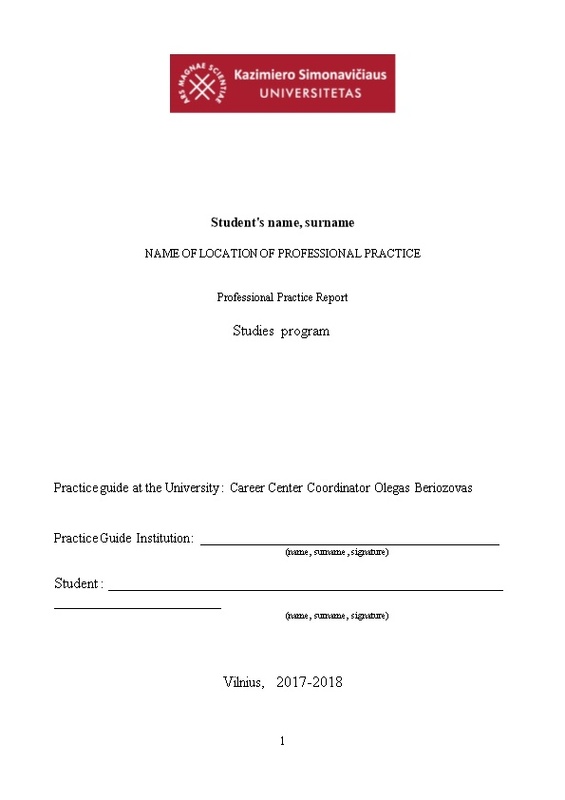 Fill in a Practice Guide at the University. Not only the comments but also the final rating are presented. The notes will also be written taking into account the comments made in the supervisor's institution / organization and the assessment of the feedback.